Does language always reveal underlying attitudes? Do lazy words confirm lazy thinking? But there is more. Short phrases or words, although useful as a code – a quick way of communicating information between colleagues who are inducted to the same cryptic language – do carry visual and pejorative moods or feelings. Say acopia to me, and I immediately visualise a frail, thin person sitting in a chair in a dark room trying but failing to stand with their Zimmer frame or progress across the kitchen to fill a kettle. Say ‘failed discharge’, and I imagine a man being delivered his lounge by an ambulance crew who wave him goodbye and leave, only for the patient to find that his breathlessness is still so bad he can’t even make it to bed, and spends the next ten hours in the same chair until the first visit from the new, inadequate ‘package of care’. Code is useful for rapid communication, but it is also overly simplistic in complex scenarios. 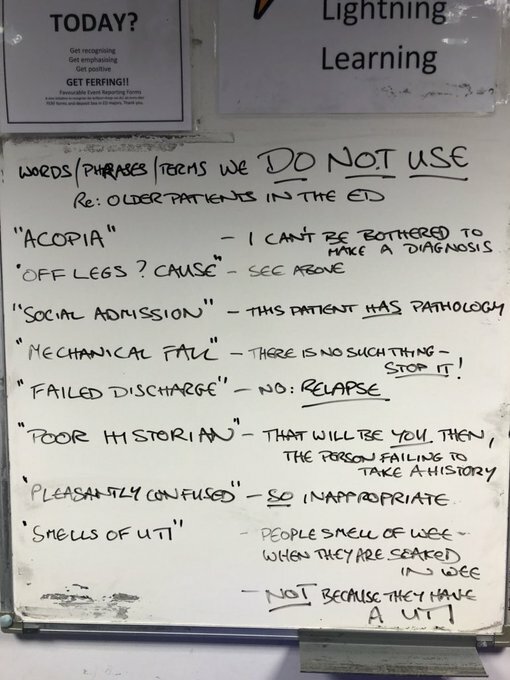 The doctor who wrote the list insists that failed discharge (i.e. rapid readmission) is referred to as a ‘relapse’. I don’t agree with this entirely, as I disagree that discharge arrangements fail because the underlying disease worsens. But I do agree with the subtle change of emphasis between the two terms. ‘Failure’ suggests the patient is weak, that they failed, whereas relapse suggests that the pathology was not completely controlled – a failure of medical management, if you like. It changes the flavour of the presentation from ‘social’ to ‘medical’, and will therefore demand a higher level of engagement from whichever doctor sees the patient in the ED. Similarly, labelling a patient with ‘mechanical fall’ could immediately switch the doctor into a lower gear, as what diagnostic magic can be required to work out why someone tripped on a table leg? It’s all about awareness, not turning off the brain, looking deeper. Mmmm. What I objected to was the idea of controlling another’s language. The imposition of one person’s preferences – however sound the thinking behind them – on others. It is an attempt to educate yes, but it feels borderline coercive. ‘Don’t talk like that in my department…’ This has happened before. I remember being corrected by an endocrinologist when I used the word ‘diabetic’. ‘No,’ he said, ‘It’s a person with diabetes.’ I rolled my eyes. But were they right? I was defining a person by their condition. This brief re-education didn’t work, as I still use the term, along with epileptic, colitic, cirrhotic and alcoholic. It’s my way of talking. Yet… I correct people too. If a trainee refers a patient to me with ‘acute liver failure’ and then describes someone with ascites and a bit of jaundice, I subject them to a fifteen-minute lecture/tutorial/harangue on the difference between cirrhotic decompensation and ‘true’ acute liver failure. I am probably as patronising and as full of medical self-righteousness as any other consultant with strong opinions and specialist knowledge. We all do it. Those who work with us risk being bounced all day between acceptable and unacceptable words. Each of thinks we are gradually improving attitudes, knowledge and patient care. As doctors we have opinions, and if we care about our area, we proselytise. That’s what the ‘banned list’ was – a kind of proselytism. You might call it part of clinical leadership, continuing (re)education, improvement. Nothing really wrong with that, as long as it doesn’t lead to those who aren’t quite up to date with being criticised, just nudged. Culture changes gradually, or else people are left behind.